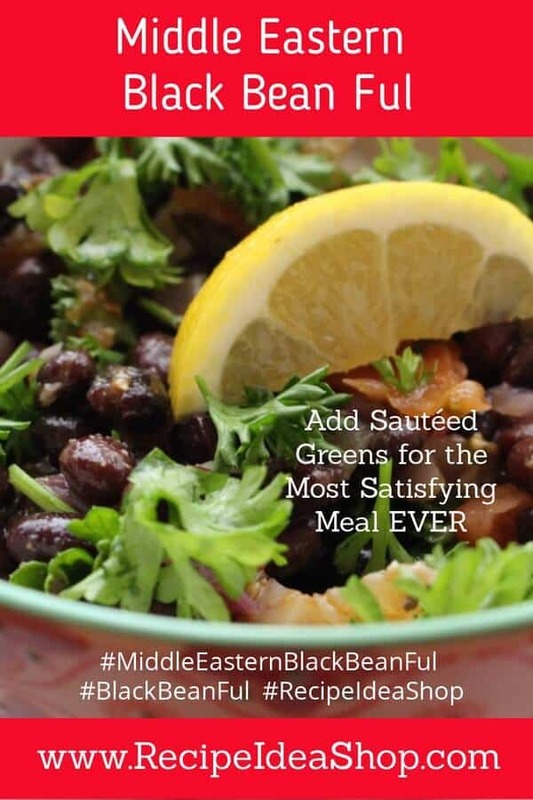 Middle Eastern Black Bean Ful. Add rice and some sautéed greens and you will have an amazing, satisfying meal that people will rave about for a long, long time. Easy and absolutely packed with flavor. 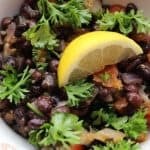 Middle Eastern Black Bean Ful, only the most flavorful bean dish you can eat. Top it with Tomato Basil Chutney for an even more delicious meal. Hi. It’s Lois in the kitchen at Recipe Idea Shop, talking about Middle Eastern Black Bean Ful, another terrific vegan recipe based on a Moosewood Collective recipe. 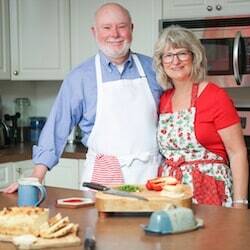 It comes from their Moosewood Restaurant Low-Fat Favorites cookbook, and it is simply called “Ful.” I absolutely love this recipe. Ful is a traditional Egyptian/Middle Eastern/North African dish comprised generally of Fava Beans, fresh tomatoes, onions, garlic, lemon and spices. I substituted Black Beans because I like them and I didn’t have any Fava Beans. And the result was terrific. The flavors just burst in your mouth. And it only takes 25 minutes to make it. Moosewood Restaurant Low-Fat Favorites suggests ideas for pairing this Ful as a side dish with other foods, but I find that Middle Eastern Black Bean Ful is excellent on its own. Add some Sautéed Greens, a piece of fruit and a bit of Amazing Gluten Free French Bread or some rice, and you have a fabulous supper. 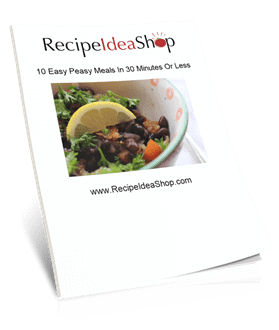 Filling, delicious, low fat, vegetarian and easy. What more can you want? I love Moosewood cookbooks. The recipes are always amazing. No matter what cookbook you use. Moosewood Restaurant New Classics Cookbook. Available on Amazon. Lately I have been buying the jarred minced garlic. It’s such a time saver. Goya Minced Garlic, 4.5 Ounce. Buy it on Amazon. 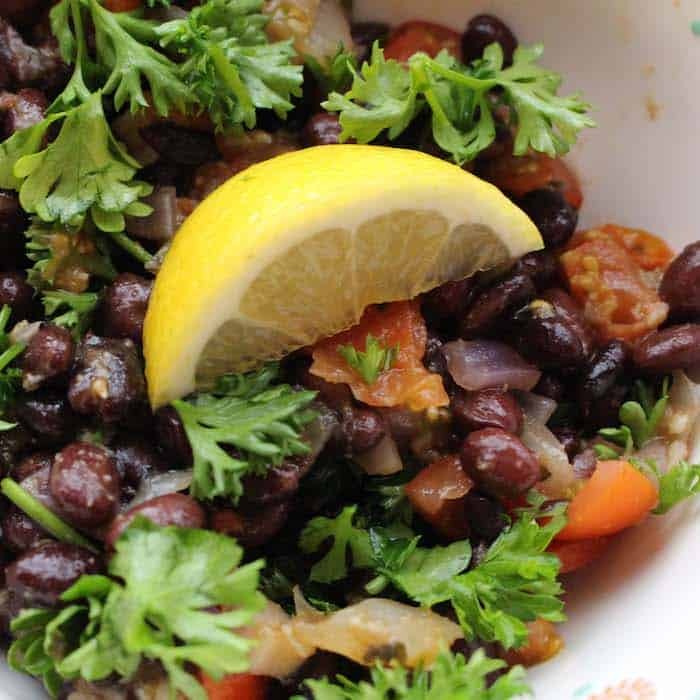 Bursting with flavor, this black bean dish can be served as a main dish or to accompany your entree. Excellent hot or at room temperature. Great for a potluck supper. Over medium temperature, heat the oil in a Dutch oven for about 1 minute. Add the onions, garlic and salt. Cover and cook until the onions are transparent, stirring occasionally. Add the mint and cumin, and continue cooking for another couple minutes. Stir in the tomatoes and heat for about 4-5 minutes, stirring periodically. Heat through, about 5 minutes. Stir in the lemon and parsley and serve with lemon wedges. 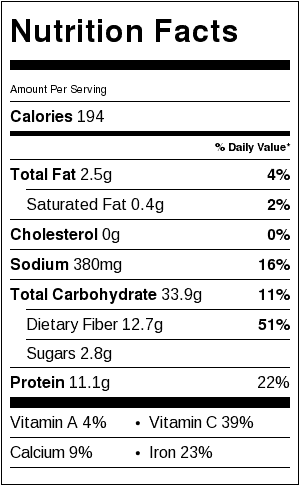 Middle Eastern Black Bean Ful Nutrition Label. Each serving is about 3/4 cup.